Since the excavation began in August 2015 almost every day has revealed new finds, discoveries and information about the Late Bronze Age. 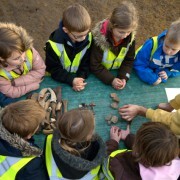 We’ve found everything from textiles and boxes to wheels and axes. The Must Farm settlement has one of the most complete Bronze Age assemblages ever discovered in Britain and it is giving us an unprecedented insight into the lives of the people who lived there 3,000 years ago. Two artefact types we haven’t discussed are metalwork and textiles, both of which offer another important layer of detail to the homes we are excavating. In this diary we’ll give a brief overview of these two groups of artefacts before discussing them in greater detail over the coming weeks. One of the most exciting elements of the metalwork present at Must Farm isn’t the metalwork itself, but its context. 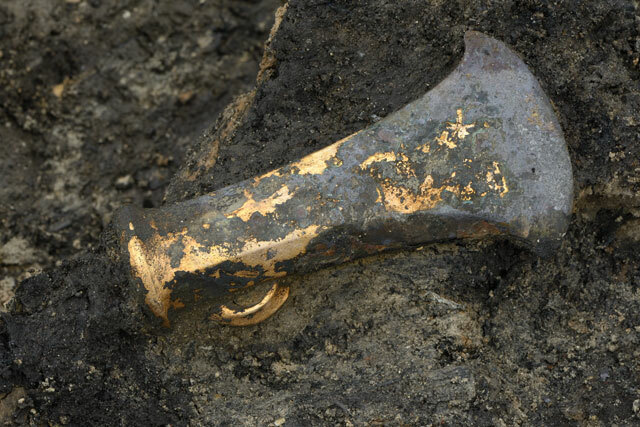 The majority of metal objects from the Bronze Age tend to be deposited in an unusual manner. Bronze artefacts such as swords, spears and axes are often found in watery locations, such as lakes and rivers. There are many theories as to why metal is found in these locations with one of the most prevalent regarding it as a form of ritual, or votive, deposition. Whatever the case, it is clear that these artefacts are not in locations reflecting their use or where they would have been present in day-to-day activity. 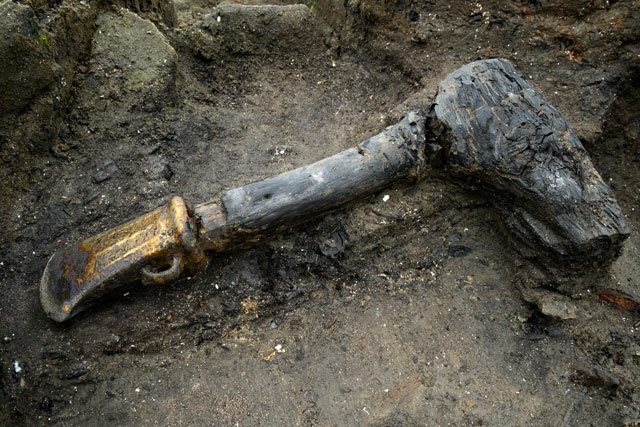 Late Bronze Age socketed axe found in the occupation material that fell into the river when the stilted house above collapsed. However, at Must Farm we are incredibly lucky to find metal artefacts still within their original use contexts inside the settlement. 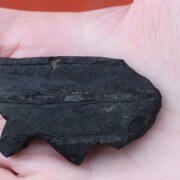 Such an opportunity is rare in British prehistory and is providing new information on the quantity and types of metalwork that would have been present in a Later Bronze Age settlement. The metalwork we have discovered covers a wide range of uses from the utilitarian: punches, gouges and axes to weaponry such as swords and spears. Each house at the settlement has yielded metalwork with the majority of it “everyday” in character. 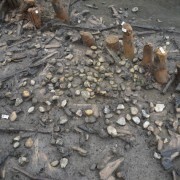 We have found a number of tools, which appear very much functional in nature though are beautiful. Many of the characteristic, Late Bronze Age socketed axes have simple groups of parallel lines on their sides, creating a straightforward but very evident style. Elsewhere in the settlement we can see evidence of axes being used: many of the upright posts have dozens of preserved axe marks at their tips. There is even a chance that we could be able to find matches between the axes recovered from the homes and the marks left on timbers. 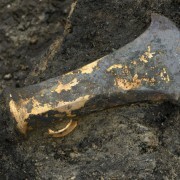 Late Bronze Age socketed axe complete with its haft still attached. These are an exceptionally rare find in Britain, only a handful have ever been discovered. Other metal artefacts have included punches, gouges and sickles. The sickles in particular are very exciting, as there is a variety of different types and their condition is often spectacular. The sickles are also very useful as they suggest the cultivation of domestic, cereal crops such as wheat and barley. Even though our environmental results are very much preliminary at this stage we are already identifying wheat and barley grains both in the sediments deposited underneath the structures but also inside ceramic containers. This combination of farming tools and the crops they were harvesting is incredibly valuable evidence and helps reconstruct the lifestyles of the people who lived at the Must Farm settlement in much greater detail. Interestingly, several of the sickles have the cutting edge on the outside of the curve. Did these particular sickles serve a slightly different function? Not all the metalwork is domestic in nature and while the assemblage is dominated by tools, weapons do appear. 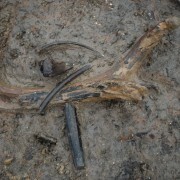 We have multiple spears from different structures in the settlement, all of which are characteristic of the Late Bronze Age. The presence of these spears, some of which are still hafted, show that there was a definite “martial” component to the settlement. This will be a particularly fascinating element of the archaeology to explore, particularly as so much of the metalwork is so well preserved with very little corrosion. Finally, we have a number of swords, large and small, from the site. 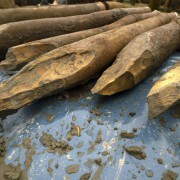 Some of these weapons probably pre-date the settlement and are more likely associated with the timber causeway that dates to approximately 1290 – 1250BC. 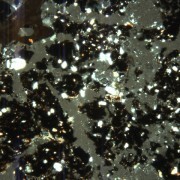 This kind of metal deposition is much more closely associated with the kind of “ritual”, watery deposits more traditionally associated with the Bronze Age. 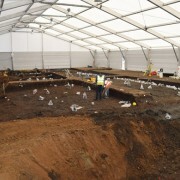 As such, the Must Farm site has a mixture of metalwork from domestic and non-domestic contexts, which is an exceedingly rare combination for prehistorians to explore in detail. We’ve already mentioned that we have found textiles as part of the current excavation, after sharing several fragments we uncovered in late 2015. However, since then we have discovered many, many more pieces making the Must Farm textile assemblage the largest Late Bronze Age collection found in Britain. Even more exciting is that alongside being the biggest collection, Must Farm’s textiles include the finest woven linen found from this period. 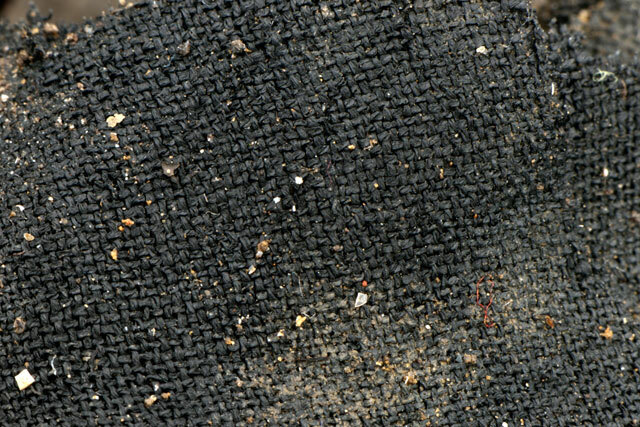 A section of beautifully preserved woven textile from beneath Roundhouse One. 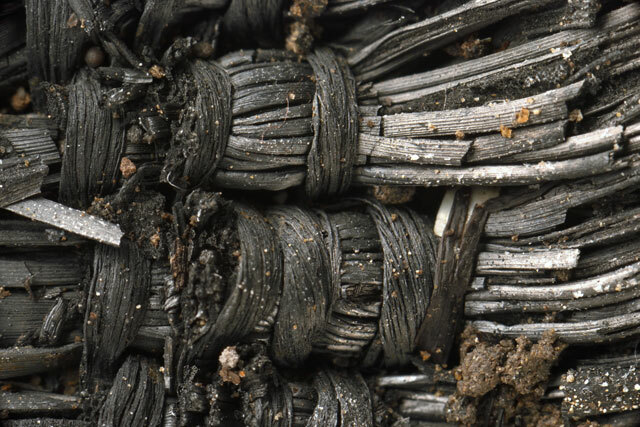 These fabrics have survived as they were charred in the fire that destroyed the settlement, which has carbonised the fibres. The presence of textiles at the site is thanks to a fortunate combination of factors. The fire that destroyed the buildings carbonised the fibres that make up the textile before they were buried in waterlogged conditions. 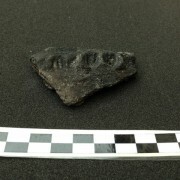 Additionally, the sediments that the textiles came to rest and, ultimately, covered the material helped to provide support for the fragile artefacts. It is extremely uncommon to find textiles from 3000 years ago on any archaeological excavation and their presence at Must Farm is yet another example of the completeness of the assemblage from the settlement. What is even more incredible about the textile is that there are elements from every stage of the manufacturing process. They range from hanks of plant fibres, spools and balls of thread to woven textiles and twining. We have clay weights too which give an insight into the creation of some of the fibres which could have used looms. Other textiles were produced using a technique known as “twining” which did not require a loom and could create a variety of different fabrics. Detail of the fibres from an area of slightly coarser textile from the area beneath Roundhouse One. Undoubtedly one of the most exciting aspects about the textiles is that it tells us that the people living at Must Farm were producing material of excellent quality. Some of the threads used in the creation of woven textiles are the diameter of a thick human hair. Creating such fine textiles required serious skill and understanding of materials. Each of the households here seems to have been creating fabric and the preservation of these materials will help us to gain a new level of understanding about textile production during the Bronze Age. Alongside metalwork and textiles, we have a wide range of other fantastic artefacts, including wooden axe hafts, sewn bark containers and much more. 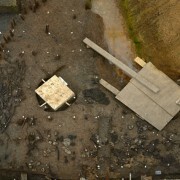 Over the next few weeks we’ll be going into much more detail about various artefacts and the contents of our buildings. Even though the excavation is ending, we’ll be continuing to share the latest information about the site as we examine our artefacts and environmental evidence in greater depth. Dig Diary 35: The Must Farm “Menu"